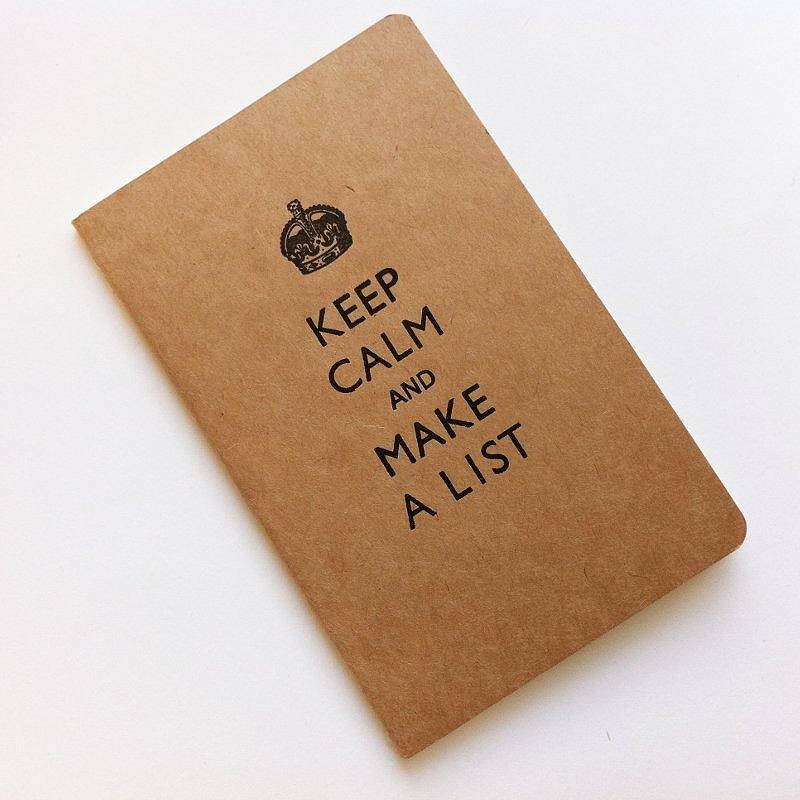 Are you staying organized on your job hunt? It doesn’t matter if you are searching for a job passively or actively, it’s wise to be organized and thorough to make sure that you are approaching each position prepared, with your best foot forward. You see, it’s easy to get confused if you’re not keeping track of the Who, What, Where and When of your applications. And so, we recommend drawing up a spreadsheet of your activity. Most importantly: so you can monitor your success, and avoid wasting time re-applying to the same position may times. This also helps so you have a quick and easy reference point for when you DO get calls back. 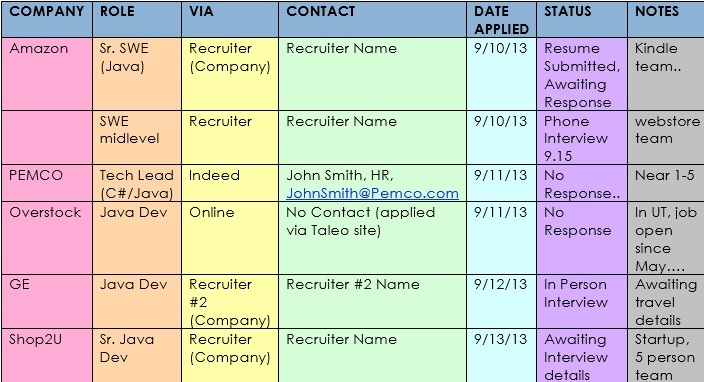 You can easily pull up your spreadsheet to reference the job & when you applied. In turn, you will come across as professional, organized, and prepared. There are some pretty universal rules between recruiting and hiring firms regarding applicants. The gist: prospective candidates cannot be marketed to a firm if they have already applied there, or been submitted by another firm, in the last 6-12 months (it varies by firm but this is a good general time frame). Note: this rule applies to any application or presentation of your resume in the last year, even if it was for a different job at the same company. What’s the harm in not telling your recruiter you’ve already applied there? Well, you certainly won’t make your recruiter happy. They’ll be unlikely to trust you or work with you in the future. Hiring companies may also consider it a sign of disorganization, assuming you didn’t know your resume had already been submitted. Even worse: the hiring company could see it as a sign of dishonesty. It’s probably a waste of time: if they passed on you once, there was probably a reason for it, so it’s unlikely to improve your chances. The simplest way is a basic Word or Excel document. List the companies you’ve applied to, dates of application, role in question, status of response from hiring company, contact person at that organization and any other notes you might want to keep on hand. For those looking for a more sophisticated method of tracking, we recommend checking out a product like Evernote. Evernote is an online tool & mobile app that allows you to take & save notes, including links and charts. The benefit of web applications like Evernote is that your data is stored on the cloud – thus wherever you have WiFi, you can access it. 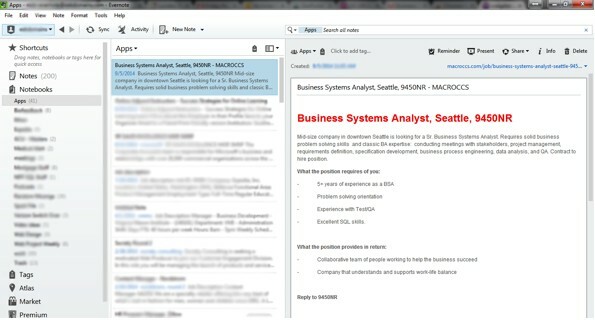 Plus, Evernote allows you to copy, paste, and save job descriptions straight from the websites where you found them. You can link these job description ‘notes’ into your tracking table for easy access later & on the go. Especially useful if the position is removed from the website and you need to reference it again before an interview! At the end of the day, keeping organized on your job search shouldn’t take too much time and the benefits could pay dividends if you ever need to reference your activity. 1. Make a tracker and at bare minimum track the date you applied, the company name and position you applied for. 3. (Optional) Keep a copy of the job descriptions for you in something like Evernote or One Note for easy reference before an interview.